The anthurium is best known for its very unusual flower appearance. It is commonly called Boy Flower or Flamingo Flower due to structure. It mostly grows as an outdoor evergreen with bushy or climbing habits. The roots can hang if it is grown far above ground, such as trees. Some species grow with roots underground as well at tree bases. This creates many options for growing them in gardens or containers. A. andraeanum is a popular hybrid that is used for many gardens. It is often called Flamingo or Painter's Palette due to the color. This perennial is often found in a rich red with a yellow center. Shades of deep pink are also common, with a yellow center as well. The leaves are often a deep waxy green that stand out in gardens. The heart shaped spathes form a colorful display and appear shiny. A. hookeri offers rounded leaves and is smaller than some species. The leaves are often closer together and have a detailed texture. It is often found growing in botanical gardens and tropical climates. A. faustomirandae produces massive leaves when it reaches maturity. These are often the size of a human torso or larger depending on age. This species is most often found wild or cultivated in a greenhouse. Anthurium is a popular flowering plant grown for its rich foliage. This plant will often grow to reach light if planted in shady spots. This can diminish the plant quality, making sunlight very important. In less tropical areas, these are often grown indoors as houseplants. The light requirements vary, making the species choice important; some thrive in a dark area of the home while others need more light. They are able to thrive in hotter temperatures and so are able to be purchased in warmer climates. Places such as Corpus Christi, TX, Rialto, CA, Lynn, MA, Mesquite, TX, and Lewisville, TX are prime examples of this. These bright waxy flowers often symbolism hospitality and openness. The reason for this meaning is how the flowers appear to be wide open. 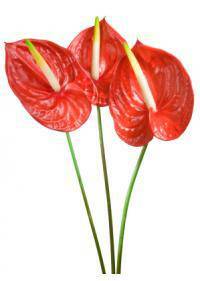 This makes the anthurium a wonderful housewarming gift for any home.